Human NOGGIN shares 99%, 99%, 98%, 97% and 89% a sequence identity with mouse, rat, bovine, equine and chicken NOGGIN. Cross reactivity of this assay with other species than human has not been tested. This assay detects free, bioactive human NOGGIN that is not bound to BMPs. A reduction of the assay’s signal when adding an equimolar amount of BMP-2, -4 or -7 was monitored. The FluoBolt™-NOGGIN immunoassay is a Metal Enhanced Direct Sandwich Fluorescence Immunoassay in 96-well plate format for the quantitative determination of NOGGIN in serum and plasma. The assay employs human based serum standards to ensure the measurement of biologically reliable data. The FluoBolt™-NOGGIN immunoassay is a Metal Enhanced Direct Sandwich Fluorescence Immunoassay in 96-well plate format for the quantitative determination of NOGGIN in serum and plasma samples. In a first step, standard/sample/control and detection antibody (fluorescent labeled anti-NOGGIN) are pipetted into the wells of the microtiter plate, which are pre-coated with anti-NOGGIN antibody. NOGGIN present in the standard/sample/control binds to the pre-coated antibody in the well and forms a sandwich with the detection antibody. 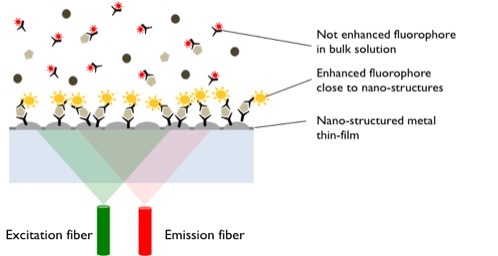 The signal of the bound fluorescent detection antibody is enhanced several hundred fold by the metal nano-structures at the plate bottom and thus highly sensitive detectable with a standard microtiter plate fluorescence reader. Measurements can either been done without washing (bottom measurement) or after a final washing step (top measurement). The concentration of NOGGIN in the sample is determined directly from the dose response curve. Storage instructions: All reagents of the FluoBolt™-NOGGIN immunoassay kit are stable at 4°C until the expiry date stated on the label of each reagent. Collect venous blood samples by using standardized blood collection tubes for serum or plasma. We recommend performing plasma or serum separation by centrifugation as soon as possible, e.g. 10 min at 2000 x g, preferably at 4°C (2-8°C). The acquired plasma or serum samples should be measured as soon as possible. For longer storage aliquot samples and store at -25°C or lower. Do not freeze-thaw samples more than 4 times. Bring the WP concentrate to room temperature. Crystals in the buffer concentrate will dissolve at room temperature. Dilute the WP concentrate 1:20, e.g. : 50 ml WP + 950 ml distilled or deionized water. Only use diluted wash buffer when performing the assay. The diluted wash buffer is stable up to one month at 4°C (2-8°C). Add 250 µl of distilled or deionized water to the lyophilized DS (Standards) and DC (Controls). Reconstituted DS and DC are stable at -25°C or lower until expiry date stated on the label. Reconstituted DS and DC can undergo 4 freeze-thaw cycles. Mark positions for DS/ Sample/ DC (Standard/ Sample/ Control) on the protocol sheet. Add 25 µl of the selected fluorescence labeled detection antibody (DAF or DA3 or DA5 or DAA) to all wells required. Swirl gently. Cover tightly with the delivered adhesive film and incubate over night at room temperature (18-26°C) in the dark or incubate for 4 h at 37°C in the dark. If your reader allows bottom reading, read the plate without any further processing at the Ex/Em wavelength fitting to the delivered detection antibody (495/518 nm for DAF, 550/570 nm for DA3, 650/670 nm for DA5, 679/702 nm for DAA). 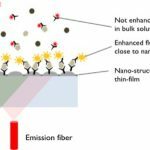 Gain should be set to achieve at least 10000 fluorescence units (F.U.) between the signal of the 0 pM and the 250 pM NOGGIN standard. Samples with signals exceeding the signal of the highest standard must be re-run with an appropriate dilution using sample diluent (DD). If your reader has no bottom read option or if you want to store the plate for documentation purposes, discard or aspirate the content of the wells and wash 3x with diluted wash buffer. Use a minimum of 200 µl wash buffer per well. After the final wash, remove remaining fluid by strongly tapping the plate against a paper towel. Read the plate in top configuration without any further processing at the Ex/Em wavelength fitting to the chosen detection antibody (495/518 nm for DAF, 550/570 nm for DA3, 650/670 nm for DA5, 679/702 nm for DAA). The gain of your reader should be set to achieve at least 10000 fluorescence units (F.U.) between the signals of the 0 pM and the 250 pM NOGGIN standard. Samples with signals exceeding the signal of the highest standard must be re-run with appropriate dilution using sample diluent (DD). Store the plate with the desiccant bag supplied at 4°C (2-8°C) in the aluminium bag. Unused wells are stable until expiry date stated on the label. Fluorescence signals of standards, controls and samples remain detectable for at least two month at the plate surface, depending on signal intensity achieved. 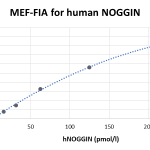 Noggin is a secreted homodimeric glycoprotein that is an antagonist of bone morphogenetic proteins (BMPs). Human Noggin cDNA encodes a 232 amino acid (aa) precursor protein; cleavage of a 19 aa signal peptide generates the 213 aa mature protein which contains an N-terminal acidic region, a central basic heparin-binding segment and a C-terminal cysteine-knot structure. Secreted Noggin probably remains close to the cell surface due to its binding of heparin containing proteoglycans. Noggin is very highly conserved among vertebrates. Noggin predominantly binds BMP-4 and BMP-2 and antagonizes their bioactivities by preventing binding to both type I and type II receptors. During embryogenesis Noggin is a crucial factor for regulation of various developmental processes like formation of neural tubes, cardiomyocyte growth and patterning as well as skeletal development where Noggin prevents chondrocyte hyperplasia, thus allowing proper formation of joints. Mutations within the cysteine-knot region of human Noggin are linked to multiple types of skeletal dysplasias that result in apical joint fusions. Noggin is expressed in defined areas of the adult central nervous system and peripheral tissues such as lung, skeletal muscle and skin. In adults NOGGIN may be associated with dissemination of tumor cells to bone, ankylosing spondylitis or pulmonary arterial hypertension (PAH). Its value as biomarker remains to be established yet. Metal-enhanced fluorescence: an emerging tool in biotechnology. Aslan K, Gryczynski I, Malicka J, Matveeva E, Lakowicz JR, Geddes CD. Curr Opin Biotechnol. 2005; 16(1):55-62. Imbalance Between Bone Morphogenetic Protein 2 and Noggin Induces Abnormal Osteogenic Differentiation of Mesenchymal Stem Cells in Ankylosing Spondylitis. Xie Z, Wang P, Li Y, Deng W, Zhang X, Su H, Li D, Wu Y, Shen H. Arthritis Rheumatol. Feb 2016; 68(2):430-40. The role of the BMP signaling antagonist noggin in the development of prostate cancer osteolytic bone metastasis. Secondini C, Wetterwald A, Schwaninger R, Thalmann GN, Cecchini MG. PLoS One. Jan 2011; 6(1):e16078. NOGGIN: a new therapeutic target for PH? Focus on “Noggin inhibits hypoxia-induced proliferation by targeting store-operated calcium entry and transient receptor potential cation channels”. Boucherat O, Bonnet S. Am J Physiol Cell Physiol. Jun 2015; 308(11). Noggin levels in nonalcoholic fatty liver disease: the effect of vitamin E treatment. Polyzos SA, Kountouras J, Anastasilakis AD, Makras P, Hawa G, Sonnleitner L, Missbichler A, Doulberis M, Katsinelos P, Terpos E. Hormones (Athens). 2018 Dec; 17(4):573-579. Noggin attenuates the osteogenic activation of human valve interstitial cells in aortic valve sclerosis. Poggio P, Sainger R, Branchetti E, Grau JB, Lai EK, Gorman RC, Sacks MS, Parolari A, Bavaria JE, Ferrari G. Cardiovasc Res. Jun 2013; 98:402-410. All FluoBoltTM IMMUNOASSAYs are validated according to sensitivity, specificity, precision, accuracy, dilution linearity, sample stability, expected values in blood donor collections and sample matrix . 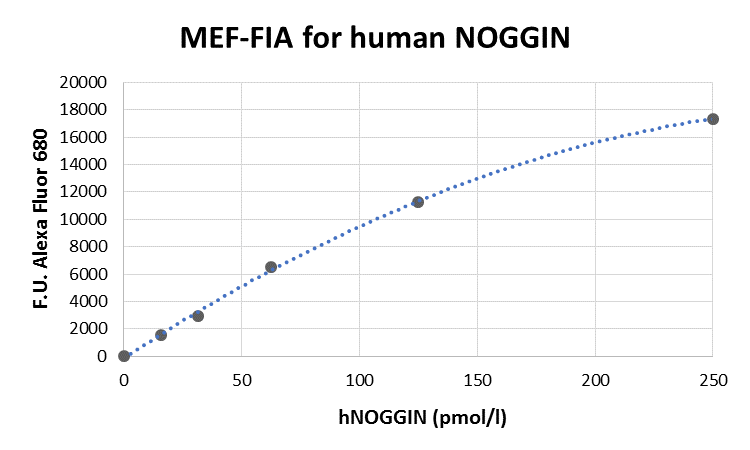 The FluoBoltTM NOGGIN immunoassay is calibrated against recombinant human NOGGIN protein (AA 28-232 of Q13253 (Uniprot ID)). To determine the sensitivity of the FluoBoltTM NOGGIN immunoassay, experiments measuring the Lower Limit of Detection (LOD) and the lower limit of quantification (LLOQ) were conducted. The LOD, also called the detection limit, is the lowest point at which a signal can be distinguished above the background signal, i.e. the signal that is measured in the absence of NOGGIN, with a confidence level of 99%. It is defined as the mean back calculated concentration of standard 1 (0 pmol/l of NOGGIN, three independent measurements) plus three times the standard deviation of the measurements. The LLOQ, or sensitivity of an assay, is the lowest concentration at which an analyte can be accurately quantified. The criteria for accurate quantification at the LLOQ are an analyte recovery between 75 and 125% and a coefficient of variation (CV) of less than 25%. To determine the LLOQ, standard 2, i.e. the lowest standards containing NOGGIN, is diluted, measured three times and its concentration back calculated. The lowest dilution, which meets both criteria, is reported as the LLOQ. The precision of an FluoBoltTM NOGGIN immunoassay is defined as its ability to measure the same concentration consistently within the same experiments carried out by one operator (within-run precision or repeatability) and across several experiments using the same samples but conducted by several operators at different locations using different FluoBoltTM NOGGIN immunoassay lots (in-between-run precision or reproducibility). Within-run precision was tested by measuring the same samples 3 times within one FluoBoltTM NOGGIN immunoassay lot. The experiment was conducted by one operator. Samples reading above the highest standard were diluted with the sample diluent provided in the kit . In-between-run precision was assessed by measuring the same samples 3 times within multiple FluoBoltTM NOGGIN immunoassay lots. The measurements were carried out by one operator. The accuracy of an FluoBoltTM NOGGIN immunoassay is defined as the precision with which it can recover samples of known concentrations. The recovery of the FluoBoltTM NOGGIN immunoassay was measured by adding recombinant NOGGIN to clinical samples containing a known concentration endogenous NOGGIN. The %recovery of the spiked concentration was calculated as the percentage of measured compared over the expected value. This table shows the summary of the recovery experiments in the FluoBoltTM NOGGIN immunoassay (recovery was independent of sample type, i.e. serum or plasma. Tests of dilution linearity and parallelism ensure that both endogenous and recombinant samples containing NOGGIN behave in a dose dependent manner and are not affected by matrix effects. Dilution linearity assesses the accuracy of measurements in diluted clinical samples spiked with known concentrations of recombinant analyte. By contrast, parallelism refers to dilution linearity in clinical samples and provides evidence that endogenous analyte behaves same way as the recombinant one. For dilution linearity and parallelism are assessed for each sample type and are considered good if the results are within 20% of the expected concentration. Dilution linearity was assessed by serially diluting clinical samples spiked with recombinant NOGGIN with standard 1 (serum stripped of NOGGIN). 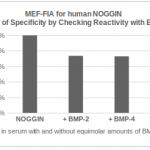 This assay detects free, bioactive human NOGGIN, that is not bound to BMPs. 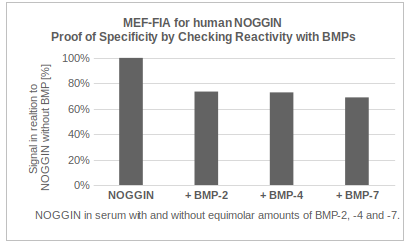 Specificity was tested by titration of the serum based kit-calibrators with human recombinant BMP-2, -4 and -7. As can be seen from the chart, addition of BMPs reduces the signal of the calibrator, which demonstrates that the assay only detects free, bioactive NOGGIN. This assay has been exclusively tested with human serum and plasma samples. No data are available for other species. However human NOGGIN shares 99%, 99%, 98%, 97% and 89% aa sequence identity with mouse, rat, bovine, equine and chicken NOGGIN. So using this assay for those species may be possible, but must be evaluated by the user. The stability of endogenous NOGGIN was tested by incubation of clinical samples at room temperature for a specific period of time and by subjection samples to repeated freeze / thaw cycles. To provide expected values for circulating NOGGIN, a panel of samples from a collection of blood donors (aged 18-69 years) was tested. NOGGIN values did not significantly differ between different sample matrices. Denosumab effects on serum levels of the bone morphogenetic proteins antagonist noggin in patients with transfusion-dependent thalassemia and osteoporosis. Voskaridou E et al., Hematology. 2019 ;24(1):318-324. Myelination in Multiple Sclerosis Lesions Is Associated with Regulation of Bone Morphogenetic Protein 4 and Its Antagonist Noggin. Harnisch K et al., Int J Mol Sci. 2019 Jan 3;20(1). Polyzos SA et al.. Hormones. 2018;17(4):573-579. The low levels of bone morphogenic protein-4 and its antagonist noggin in type 2 diabetes. Yurekli BS et al., Hormones 2018;17(2):247-253. The BMP antagonist Noggin is produced by osteoblasts in response to the presence of prostate cancer cells. AlShaibi HF et al., Biotechnol Appl Biochem. 2018;65(3):407-418. Xie Z et al., Arthritis Rheumatol. 2016;68(2):430-40. NOGGIN: a new therapeutic target for PH? Focus on "Noggin inhibits hypoxia-induced proliferation by targeting store-operated calcium entry and transient receptor potential cation channels". Boucherat O, Bonnet S. Am J Physiol Cell Physiol. 2015 1;308(11):C867-8. Secondini C et al., PLoS One. 201, 13;6(1):e16078.